We work with our customers to design, manufacture, maintain, install and move custom manufacturing equipment for your specific production line. We are very proud of being an American manufacturer of high speed industrial bakery equip. We are agile and experienced, always adapting our process to meet your ever-evolving needs. Buying equipment for your Bakery? let us help... We can Disassemble, Move and Re-install your equipment for you, anywhere in the world! We have full machining and fabricating ability in Livermore California. Give us an opportunity to make your parts and we guarantee you won't be disappointed! 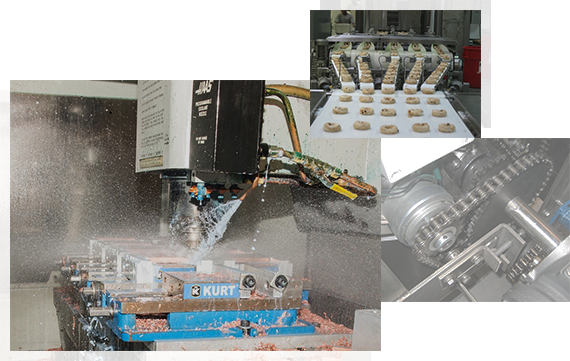 BakTek Bagel production systems can produce up to 30,000 full size bagels and 45,000 mini bagels per hour. Our innovative designs and rugged construction help minimize sanitation time, eliminate down time and maximize the bottom line.